Huawei has handed out power banks to fans queuing overnight for the iPhone XS launch in Singapore. A message on the power bank packaging suggests iPhones don’t have a long battery life. 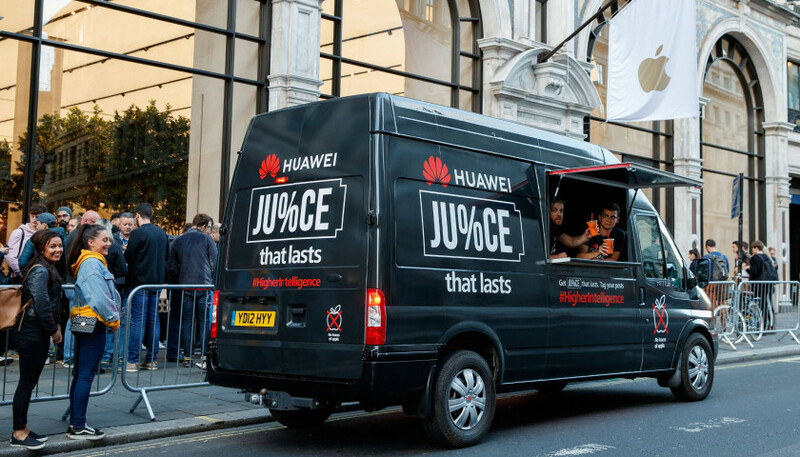 Huawei also had a van at the London launch, offering juice and charging stations. It seems like every iPhone launch is accompanied by ham-fisted reactionary marketing from an Android brand. Now, it’s Huawei‘s turn to jump on the bandwagon with the iPhone XS launch. The Chinese manufacturer handed out over 200 power banks to fans waiting overnight for the iPhone XS to launch in Singapore, according to CNET. These weren’t your cheap 4,000mAh chargers either, as the power banks weighed in at 10,000mAhs. “Here’s a power bank. You’ll need it. Courtesy of Huawei,” read the front of the power bank’s packaging. Apple’s devices have been criticized for battery life before, and they generally have much smaller batteries than their Android counterparts. The promotional tactics come just a few weeks before Huawei unveils its Mate 20 series. The company’s latest phablet will have the new Kirin 980 chipset, and is also expected to include a triple-camera setup on the rear. The Mate series has traditionally offered a large, 4,000mAh battery, but it seems like the Mate 20 series will up the ante with a 4,200mAh pack. So if you were hoping to leave your power bank at home, you might want to keep an eye on this device. What do you think of these promotional stunts for the iPhone launch? Let us know in the comments!